PamKittyMorning: The one where I still don't complain about the weather. The one where I still don't complain about the weather. Morning friends! How are you? We're heading into the weekend and around here it's going to be a scorcher! I've got my fans out and my window monitoring schedule is in place so I'm ready. I'm not going to complain YET, but I make no promises about the future! Yesterday I was feeling really cheerful while doing some blanket stitching! 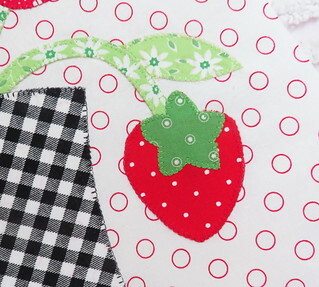 This is a peek at a small part of my submission for volume 16 of the Quiltmaker's 100 Blocks magazine. I really like this block and I'm crossing my fingers it is accepted. I've been feeling very inspired to sew lately and I'm always happy when I'm blanket stitching! It's probably my favorite thing. It is lovely, will surely be accepted! Stay cool! Hello my Bay area friend - I live in rural Amador county and am retreating to my quilting cave for the entire weekend. So cute Pam!! Looks like cover material to me. we are hitting the road but tell me why we ar headed to the desert in this weather? sigh..it sounded like a good idea a few months ago. think I will be happy if the aliens find us in Roswell next week and beam us up to a cooler climate. Love this little strawberry on the vine! You do such neat blanket stitching! You'll probably laugh, but I do not like when it gets above 80 here. Maybe because it comes with humidity - so it is always 10 to 15 degrees even hotter than the thermostat says. I'm not complaining - yet - either :)!